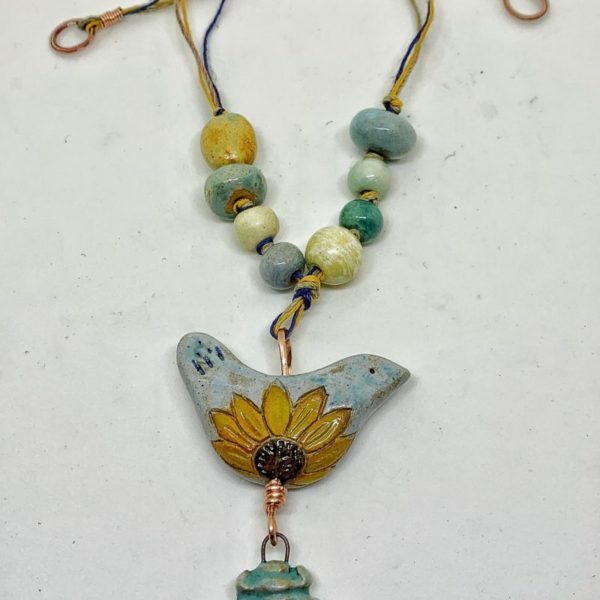 You could’ve knocked me over with a ceramic feather when Terri DelSignore (Artisticaos) asked me to be part of the Art Bead Scene blog team. 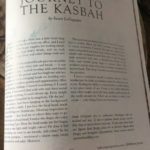 I’ve not blogged before, as I couldn’t think of what I would say. 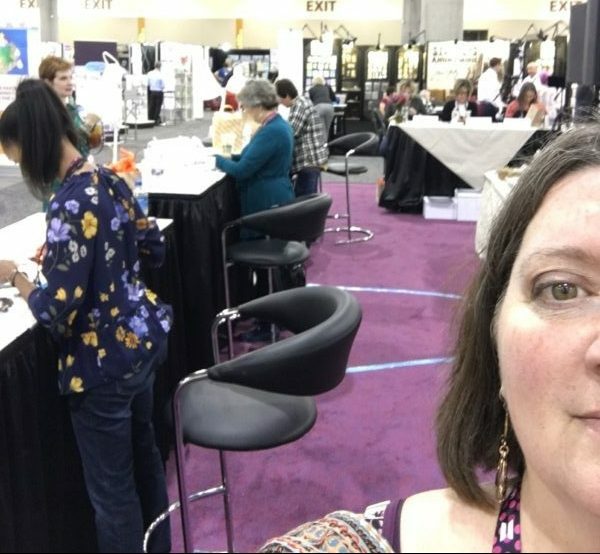 With more thought about blogging and Art Bead Scene, the more excited I became. 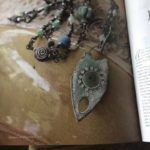 I have been published in several magazine’s: Jewelry Affaire, Belle Armoire Jewelry and Artisan Jewelry Times, So I have been blogging, just in article form (that’s what I’m telling myself, anyway). So, a bit about myself…. my name is Susan LeGuyader, Queene Bead Design. I’ve been making jewelry for years but finally feel as if I am coming into my own as an artist and designer. 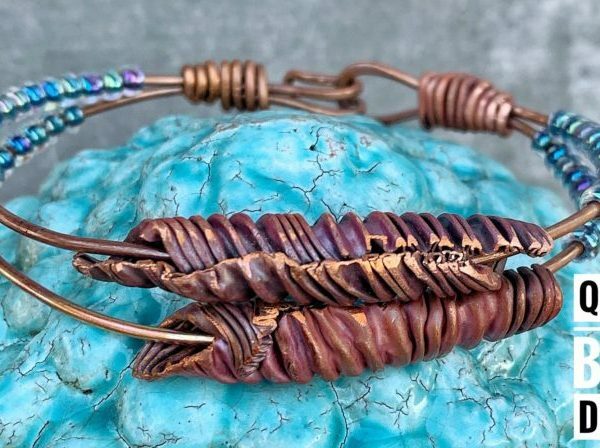 I love combining artisan components (usually ceramic beads) with wire. I always try to make all my own metal findings, chain, clasps and such. Even headpins. 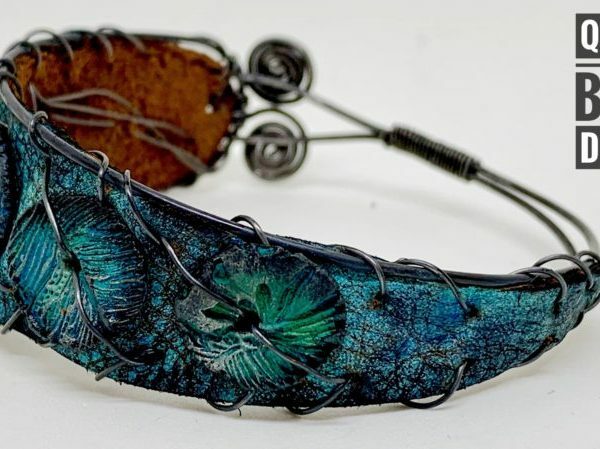 Often combining those pieces with leather and sari silk. I’ve recently started to explore metal smithing and have really been enjoying the pain and pleasure of learning this new skill. 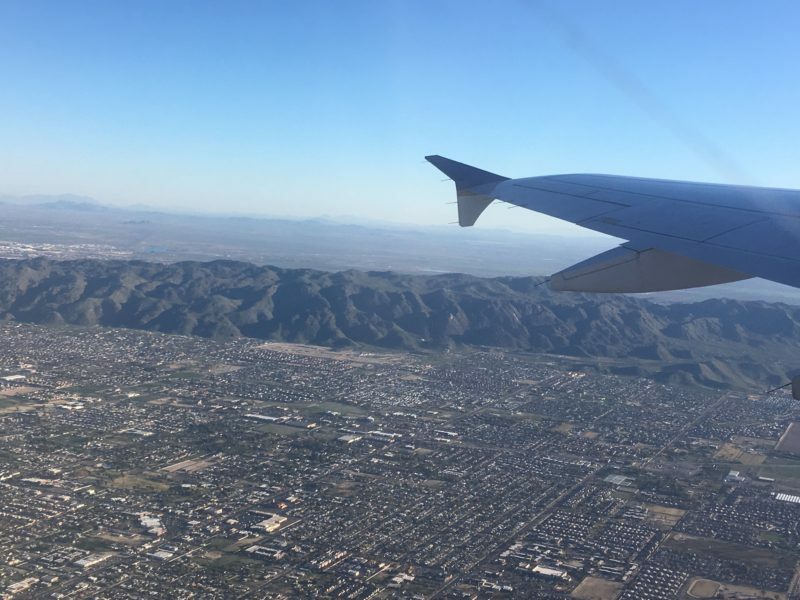 Recently, I probably experienced one of my most exciting adventures in my jewelry journey. 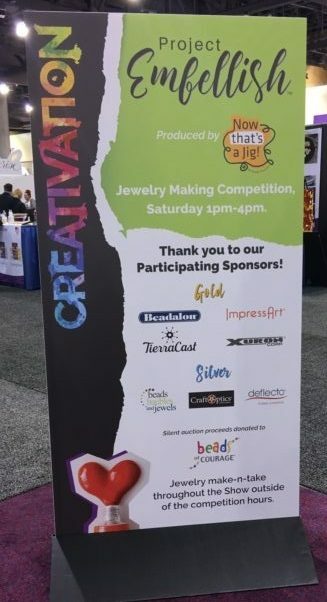 I haven’t mentioned it but I am on the 2018 Design Team for Brenda Schweder and Now That’s a Jig, so when Brenda asked, I flew to Phoenix, Arizona to help her with Creativation 2019 https://www.facebook.com/AFCI.Global/ and Project Embellish. Three of our amazing contestants during Project Embellish. I was such a fan girl! 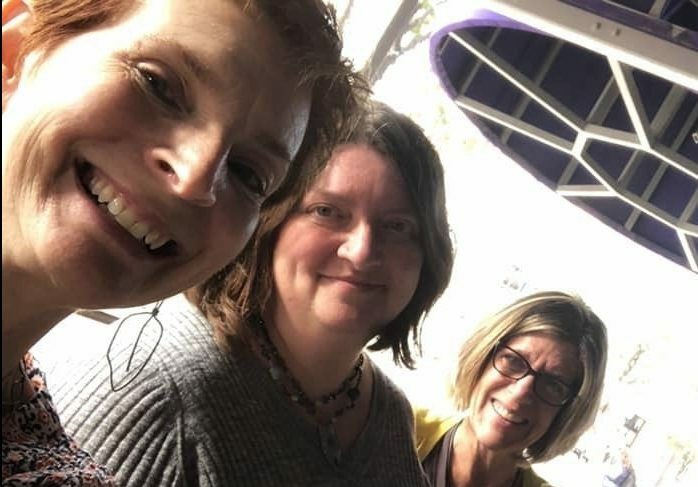 I got to meet some of my most inspiring designers: Brenda Schweder (first time in person); Susan Lenart Kazmer, Jen Cushman and Cat Kerr. Just to name a few. THEN I got to meet some amazing ladies that will inspire me in the future: Tammy Honaman, Rita Padua-Pannulla to name a couple. My head is still spinning. We stayed at a great house. Ate some truly amazing food. If you can, find Forno301 near downtown Phoenix. It will be worth your time and your tastebuds will thank you. Returning home to my husband and sons, in the Pacific Northwest, I’m ready to settle in for the rest of our winter, writing, creating, learning and making. On my next blog, I will do a tutorial and we will see what trouble we can get into. 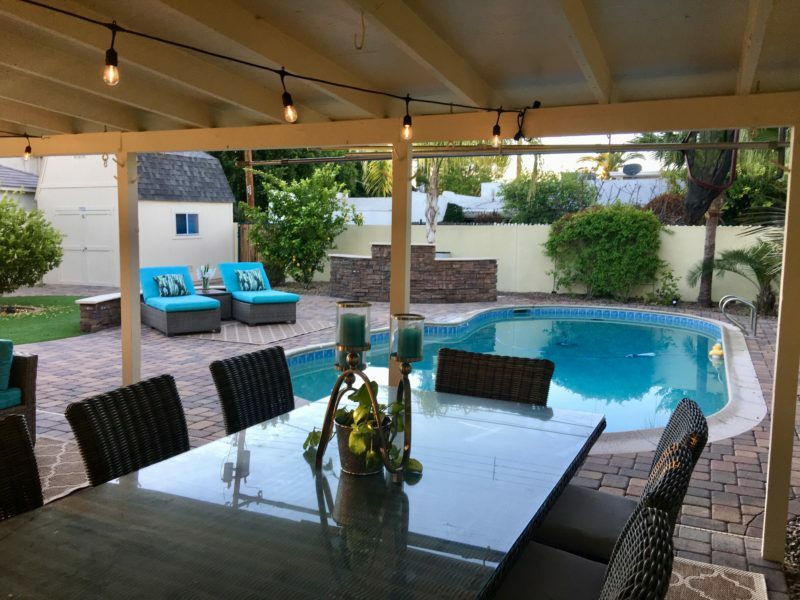 My final thought… I wanted to take a moment to thank Heather Powers, Terri DelSignore, Anne Potter, Sarajo Wentling, Loralee Kolton and Erin Prais-Hintz for the warm welcome. I look forward to this adventure with you. Welcome to the ABS team, fellow newbie! I’m so excited to have a Jig expert in the group and can’t wait to see what you have to share with us. I need to actually use mine!! Love that dragonfly you shared in your post too… swoon!! It’s going to be a great year! Wow Susan! What a fun adventure your passion has been taking you on! So cool to meet the people you are inspired by! So happy to have you on the team here!! Looking forward to your lovely designs!! I’m looking forward to your posts! I’m hoping to work more with wire this year, so you will be an inspiration! Thank you, so much! If you have any questions, get ahold of me. I’m happy to help!